The front forks came from a moped. The frame was chopped and welded from a mountain bike. 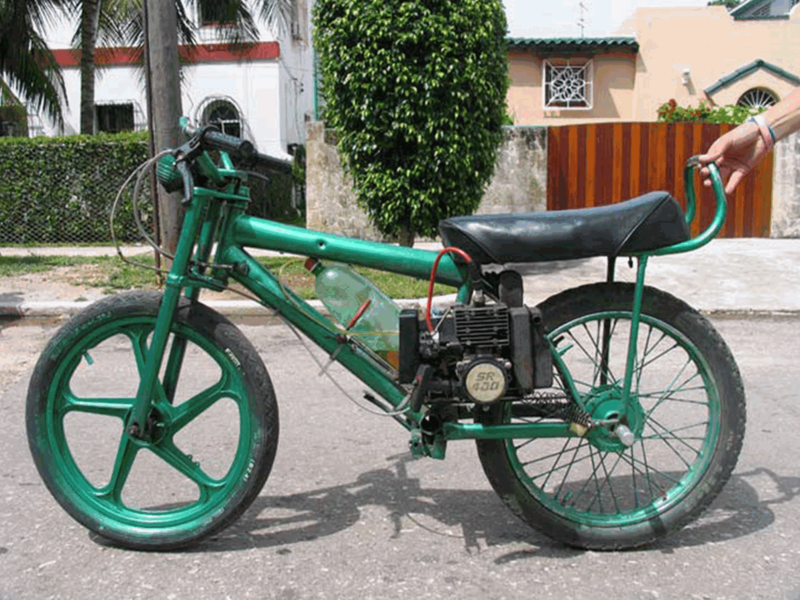 The tired motorcycle engine was rescued from a scrap heap. And the mismatched wheels were scavenged from the council tip. It wouldn’t win any design awards (and it definitely would struggle to get an MOT) but, for one proud and impoverished owner, it’s the hog of all hogs! Money – or, to be more exact, the lack of it – is the driving force of practical creativity. Necessity may be the mother of invention but poverty is the big daddy of back-yard innovation. Perhaps this explains why the UK is a nation of inventors rather than tycoons. Cash crises force us to create our own inspired solutions but, having done all the hard work, we run out of puff and let someone else profit from our genius. 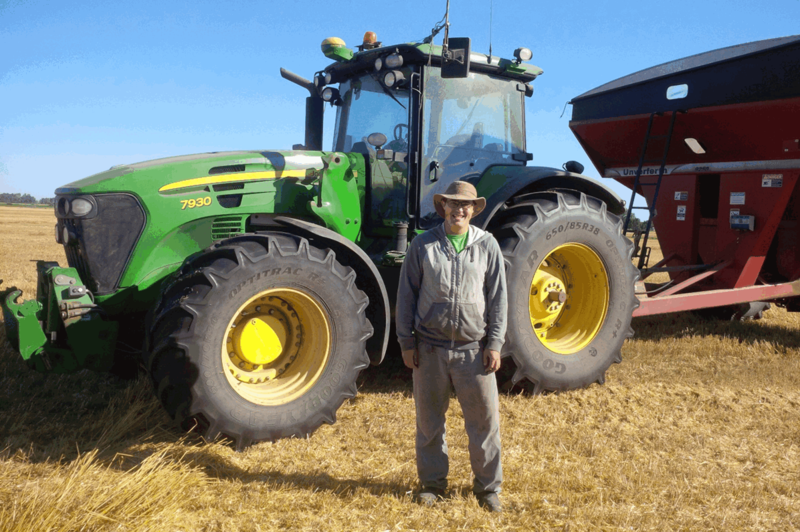 Matt Reimer is a hard-working arable farmer from Canada’s Mid-West. Like most people in this tough industry he is stoical about the weather that can turn winter wheat prairies into sub-zero wastelands. A three-year slump in major crop prices had forced farmers to cut costs to the bone. Wages – one of the biggest overheads of all – were a priority concern. But how can you harvest crops without people? This was the question that every farmer was asking… a question that no agro-engineering company appeared capable of answering. So, rather than wait patiently for someone to develop a solution, Matt Reimer designed one for himself. Taking his eight-year old John Deere tractor, he modified it with some drone parts. Then he loaded a bunch of open-source software onto a basic tablet and built himself a robotic tractor that could drive itself. With free technology, minimal expenditure and a lot of ingenuity, Matt Reimer instantly cut his wage bill by $8,000 a year. Remember, we are talking about an ordinary farmer; not an inventor, a design engineer, a robotics specialist, a seasoned programmer or an expert in autonomous vehicles. Matt Reimer is a totally self-taught innovator. A humble man driven by cost-cutting imperatives and an acute shortage of funds to achieve something that eluded the biggest manufacturers in the world. He is also exceptionally generous. Conscious that money and time are tight for many neighbouring farms, he is now replicating his solution. As Matt Reimer candidly observes: “Even if a huge corporation releases an autonomous tractor in the next twelve months, it’ll take another 15 years before that benefit trickles down to every farm.” And there’s one further inescapable truth that Mr Reimer is too modest to point out: his invention will always be massively cheaper and universally affordable! One of my clients is the head of innovation for a major loyalty card provider. For 10 years he had run the IT function in the Europe and Middle East. However, concerned that the company was no longer nimble enough to be innovative, he persuaded his Board to let him set up and lead a new ‘skunk works’ team. He turned down a substantial budget; preferring instead to draw upon the goodwill of colleagues and third parties. For example, I have introduced him to Clustre’s community of world-leading innovation firms. And this inspired support has proved invaluable. My client set out with no coders, no architects, no testers, no analysts, no project managers and precious little funding. To succeed, he needed to work with the most visionary partners and to deliver very, very rapid results. And by rapid, I mean 30 days. He set himself a deadline of spending no more than one month on any single idea. If a cobbled together prototype didn’t excite management into funding the fully-fledged product, it was consigned to the parts bin. That was – and still is – his uncompromising ‘back it or bury it’ approach. Fortunately, for my client, he has received a lot of backing. The fact that he has delivered twenty prototype projects in just under two years – and simultaneously launched businesses in Italy and Ireland – proves just how well he has kept to this punishing regime. Three of his prototypes have already been turned into products… and one of them is sure to send shock waves through the payments industry. Just watch this space. There are many shared qualities that bond my client and Matt Reimer together. One of the most striking, though, is their modest funding demands compared to the current trend for super-costly Innovation Labs. As more and more companies jump on that expensive bandwagon, I do have to question the wisdom of this strategy. Especially after reading a recent statistic that the average life expectancy of an Innovation Lab is four years – the same survival span as most CEOs! It’s controversial and undoubtedly contentious, but there is one consistent truth to this story…less investment really can deliver more innovation.